Your network assets can vary from hardware (routers, switches, hubs, firewalls, printers, hosts, servers and wireless access points) to software assets like OS, applications, patches and updates. Irrespective of the size of the network, maintaining an asset inventory, and keeping tabs on the changes, especially in environments where multiple administrators oversee operations is a difficult task. This is where a good network management suite can help make asset monitoring easier– by automatically discovering and monitoring network assets for both local/remote networks; by tracking asset ownership and by creating an updated inventory of hardware/software assets, their dependencies and attributes. Products like WhatsUp Gold provide accurate features for network assets. By using a variety of tools like ARP, SNMP, LLDP, WMI and Telnet/SSH, WhatsUp Gold can automatically discover layer 2 and layer 3 devices in the network. Customizable dynamic maps in network mapping software, giving device locations and interconnections, at both physical and IP levels can then be created. These maps can be updated as changes occur, or based on scheduled scans, thereby giving an up-to-date, full visibility into network assets. 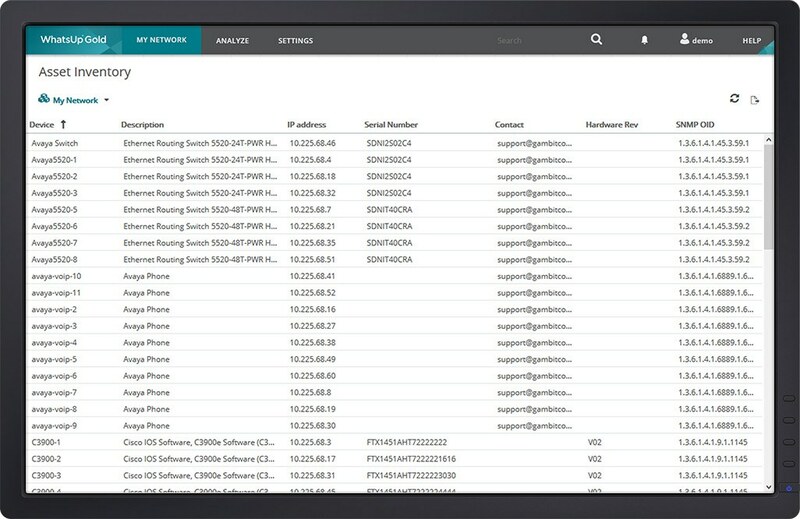 Additionally, WhatsUp Gold’s inventory capabilities provides device and platform identification across a variety of vendors including Cisco, HP, Dell, VMware, Alcatel, 3COM, Extreme, Netgear and Nortel, among others. The tool also comes with comprehensive reporting features – Asset/Inventory Reports can be generated to display a detailed list of all assets; Installed Software Inventory reports can be used to display Windows Devices and the applications running on them; Operating Systems Report and BIOS Reports show the OS/BIOS on each discovered Windows device; and Warrantee Reports show warrantee expirations and service information.